The Hyundai Santa Fe has made its public debut at the Geneva Motor Show 2018. The SUV is set to go on sale later this year and the company has announced its plan to launch the New-Generation Santa Fe in a hybrid and plug-in hybrid version as well. The fourth-generation Hyundai Santa Fe finally makes its world premiere at the ongoing Geneva International Motor Show 2018. This is the first time that the new-generation Santa Fe has made its public debut and the SUV will officially go on sale in the US markets in the summer of 2018. The new-gen model will be available in the standard two-row five-seater option and a long-wheelbase three-row seven-seater option as well. 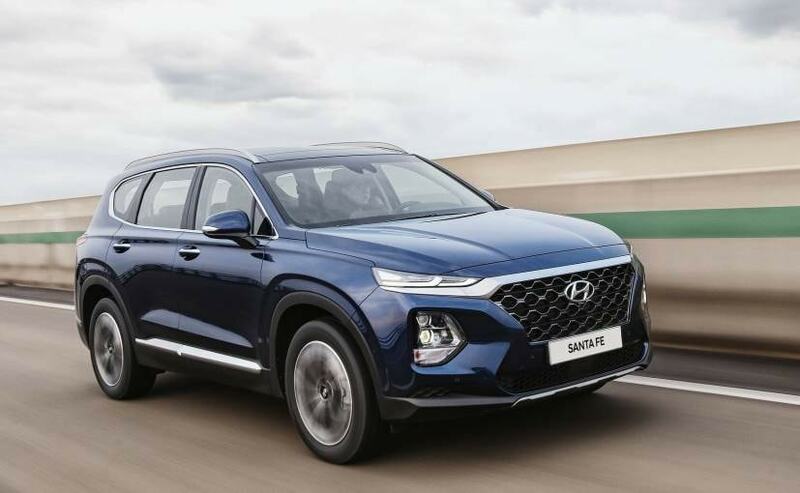 While the new-gen Hyundai Santa Fe has been introduced with both petrol and diesel engine option, the carmaker has now announced its plan to launch the New-Generation Santa Fe in a hybrid and plug-in hybrid version as well. Powering the 2019 Hyundai Santa Fe gets the choice of three, four-cylinder engine options - 2.4-litre GDI and 2-litre turbocharged petrol engines along with the new 2.2-litre CRDi turbocharged diesel engine. The former petrol engines offer an estimated power output of 185 bhp and 232 bhp respectively, while the new diesel motor is capable of curing out about 200 bhp. All three engines will come mated to an 8-speed automatic torque converter as standard. Visually, the new Santa Fe has gone through a major evolution with the new design and styling. Up front, you have Hyundai's signature cascading grille with composite lightings like the Kona comprising LED daytime running lights positioned on top of the twin LED headlights as individual units. The new Santa Fe has also grown in size with an overall length of about 4750 mm, a width of 1879, and an increased wheelbase of 2766 mm. The cabin, on the other hand, comes with premium quality interior with a horizontal and roomy layout and enhanced visibility. The centre stage on the new dashboard is taken by a new touchscreen infotainment system buttons, equipped with Android Auto and Apple CarPlay. There's also an available Qi wireless charging pad for compatible Android devices, as well as Apple iPhone 8 and iPhone X. There is also a Heads-Up Display (HUD) projects an 8.5-inch virtual image onto the windshield. Whereas on the safety front, the new Santa Fe gets features like - forward collision-avoidance assist, blind-spot collision warning, safe exit assist, lane keeping assist, driver attention warning, rear view monitor with parking guidance, rear cross-traffic collision-avoidance assist and more.